My interest in guitars dates back to the early 70’s when I received a guitar as a present from my wife Monika. The guitar was simple: mahogany back and sides, spruce top, no binding or purfling. A good friend of us, who was a gifted guitar- and lute player, introduced me into the first steps of guitar playing. Later, we often played romantic music for two guitars together, what I am doing now together with my son Emanuel. This, my first guitar, was stolen in a mountain cottage in the Austrian alps. After the purchase of a more expensive classical guitar, a hand-made Shiro guitar from Japan, I realized for the first time the enormous influence of wood selection and design – this guitar was made from Brazilian rosewood with a fine spruce top and cedar neck – on the sonority and projection of a classical guitar. Born in Munich, Bavaria, in 1943 I come from a family who was owning a shop for paints and enamels in the Westend of Munich. I was meant to take over this shop, however, I rather decided to study Biochemistry at the University of Tuebingen from 1968 – 1974. I worked then for a doctoral degree in X-ray protein structure analysis at the Max-Planck-Institute for Biochemistry in Martinsried, became a docent in Biochemistry at the Technical University of Munich, and 1991 a Professor for Structural Biochemistry at the Karolinska Institute in Stockholm, Sweden. On the side I had an early strong interest in wood-working and making furniture and equipment for our house. When retirement age came closer, I realized, that after the many years working with computers and graphics systems, I would prefer to work more with my hands again. However, this does not mean that I have left Science: guitar making is also kind of a Science, with its interesting problems in acoustics which are related to the stability and design features of the guitar box. 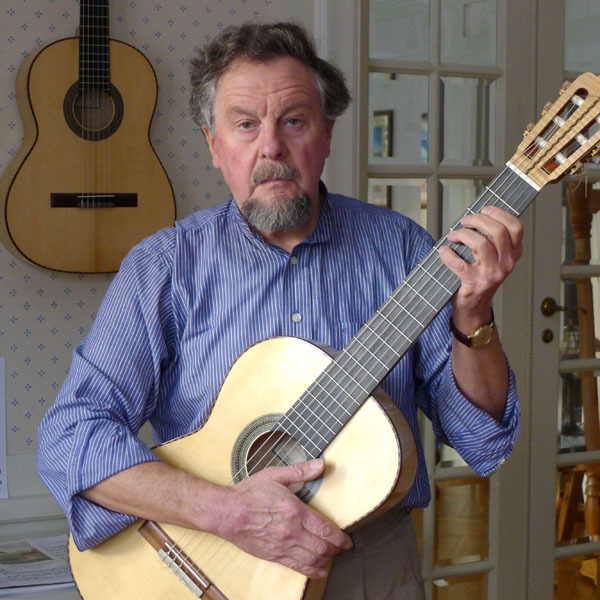 In 2005 I was fascinated by a course in guitar making which was led by the German luthier Curt Claus Voigt from Munich. After this course I was invited to build a second concert guitar together with him in his workshop in Munich, Franziskanerstrasse. This experience – building a fine classical guitar with maple back and sides and a selected spruce top – soon has become an irreversible step towards guitar making on my own in my workshop in Lidingö, close to Stockholm, Sweden.